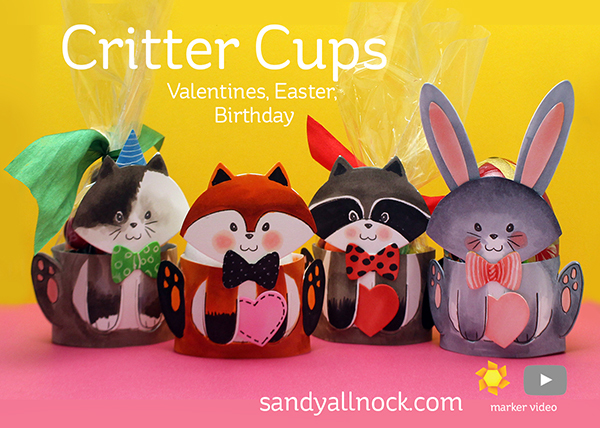 I know it’s getting close to Valentine’s Day – but I wanted to get these out quick for those who need some cute treat cups for a Valentines party! They’re also great for Easter, and birthdays, and heck – who wouldn’t smile if you delivered them a coffee wrapped in a raccoon?? Watch the video below or click HERE to see it in HD on YouTube. These are really cute – and you can turn them into all kinds of fun animals. And adapt them to be “larger” bands to accomodate whatever you want to put in them! My panels are 6″ x 1.5″ but make it longer and put it on a child’s bedpost, a lamp…..all kinds of fun uses! I think your little friend Penny would enjoy making these with you! How cute are they, great. I love them all, thanks Sandy! I just love AI.They always push forward for our creativity.I love these. For odd shaped died images you wish to stamp you can just cut one of your pieces from a rectangle and then drop the die cut piece back in and stamp, take out that one and drop in the next one. Keep the negative piece as a template with your stamps and next time just cut the heads again and put them in your squared up template! They are so cute,they would be great for a birthday party.